For those of you living under a rock, or perhaps more appropriately under a blarney stone, yesterday was St. Patrick’s Day. I guess now is also a good time to mention that despite Walt Disney’s assurances and “documentary” techniques King Brian and Darby O’Gill also didn’t really exist. 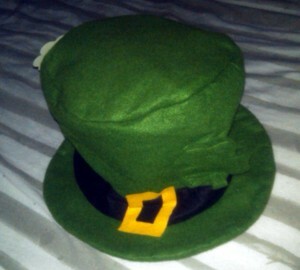 Tis the season for all things green, including green felt hats. The first team that I recall, going green was the Boston Red Sox. The green uniforms and hats seemed an obvious choice based on the amount of Irish American fans in the Boston area. 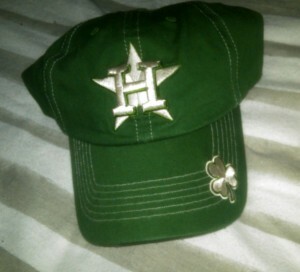 The Houston Astros joined the St. Patrick’s Day green movement this season. This year the Baltimore Orioles took the green movement a step further with a charity auction of autographed game worn green cartoon bird caps. Don’t feel like bidding on green Orioles hats? Don’t worry you can still get into the green swing as well with various green items available for purchase for all 30 teams. While the green gear is popular with the fans it also allows the players to try something new in Spring Training. There are special uniform nights throughout the season but green uniform day is the only one that falls during Spring Training. So as a public service announcement next time March 17th rolls around do not adjust your set when you are watching that Spring Training game. Your eyes are not playing tricks on you and the players really are wearing green. Now if you see a leprechaun at the ballpark and ask to see his pot of gold odds are it is just Don Zimmer. While ballparks across Florida and Arizona are coming to life with the sounds of Spring Training baseball, there is another tradition of the season that has arrived a little closer to my Texas home. It is rodeo time and all throughout town the sights, smells and sounds of barbecue, bucking broncos and music abound as the annual salute to all things country and western rolls into town. Rodeo time has come to Houston and everyone is getting into the spirit. For several weeks the days and nights will be filled with livestock auctions, skills competitions and nightly concerts. As part of this rodeo bonanza television ads for everything from trucks to mattresses focus on stampedes, herds and other buzz words of the season. Another tradition of the season is the unexplainable need of the local television reporters to dress up in rodeo gear while they are covering the various activities. Some of the reporters look the part, but most of them definitely look like they are all hat and no cattle. I have always said that you either are something, or you are not. So the dressing up as a cow poke, when you are a obvious city slicker, really is not fooling anybody. Still, I am sure when rodeo rolls around next year there will still be the pretenders that dust off those once a year duds or go to the Western wear store to get something new. In the decade plus that I have lived here I have yet to attend a rodeo. When people ask me if I am going to the rodeo, and I reply that I am not, often times it is like I have stomped their balloon animal into tiny little pieces. It is not that I am anti rodeo per se, I just don’t feel the need to battle the crowds to see the events and concerts. 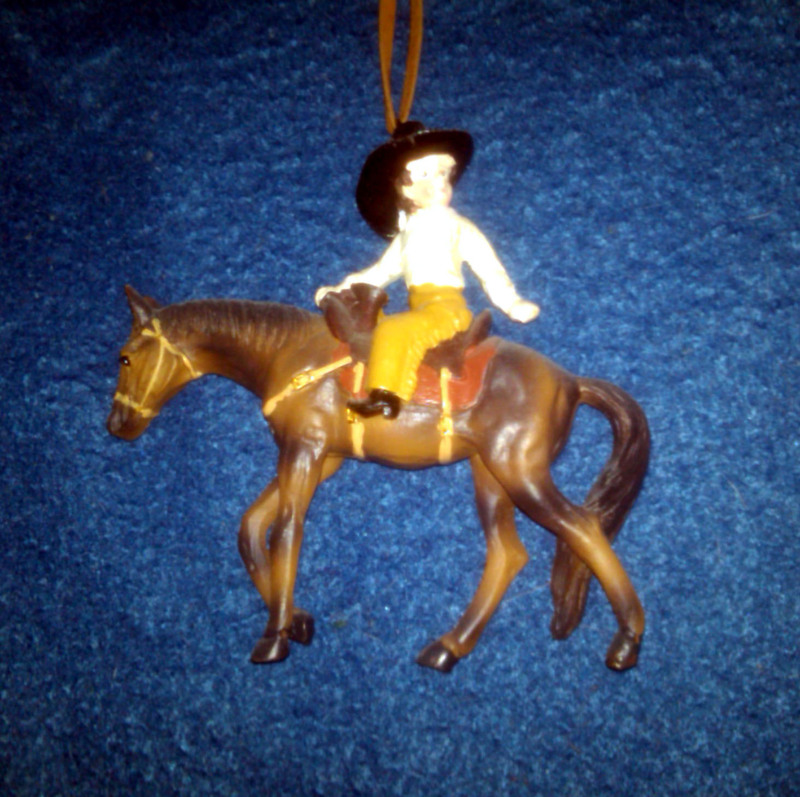 Plus, growing up I was not really exposed to the cow and horse events where it became something that I am drawn to. Don’t get me wrong, I have much respect for the rodeo performers and I know that they each have spent years honing their craft on horse and bull. I can also respect the people who raise livestock for the various judging. Countless hours and sleepless nights go into any effort to become the best at anything. While there are always the exceptions and phenoms that seem to have everything come easy to them, for the rest of us we get where we are through hard work and practice. The same can be said for the baseball players kicking up dirt on those various Spring Training ballparks. Each of them has spent years honing their skills and making countless sacrifices to reach the pinnacle of their field. 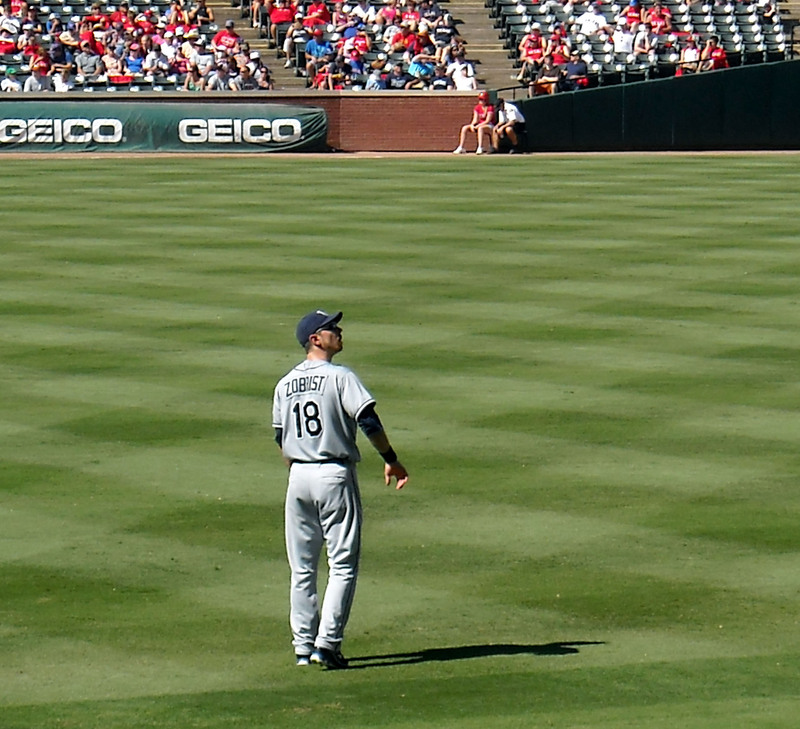 Tampa Bay Rays outfielder Ben Zobrist was a popular target of hecklers at Rangers Ballpark at Arlington. While not working with temperamental bulls or raising sheep with the best looking wool, they have nonetheless paid their dues and earned their place in the spotlight. This is why I have never understood the activity of heckling players when someone attends a sporting event. Even if someone does not necessarily like the other team or certain players it seems like one could respect the amount of time and effort they took to get there without the need to resort to name calling and other tactics. To be clear, I am not talking about the “little league” heckling about “belly itchers” which is started as a way to focus wandering minds in the dugout and create team chemistry. I am talking about the heckling that amounts to personal attacks and other areas that seem to go beyond the line of good taste. And yes the players can usually tune out the stands but there have been a few times when I was sitting in the outfield that I could see a physical reaction from the player who was the target of the heckling. Proponents of heckling, when confronted on the issue, will usually quote the First Amendment or say that buying the ticket gives them the right to shout down at the players. While I am a huge believer in freedom of speech and the First Amendment I also believe that the freedom of speech comes with responsibility and does not protect all speech. Dr. Pepper Ballpark in Frisco, Texas is the only ballpark where the bullpens are surrounded on all sides by the fans giving hecklers prime access. The level of heckling I have seen at ballparks varies and some regions definitely tend to raise it to an art form more than others. Still, whenever I am around heckling I cringe. I especially find it unsettling when the heckling is multi generational. When one heckles in front of their children they are basically ensuring that the trend continues for another generation. 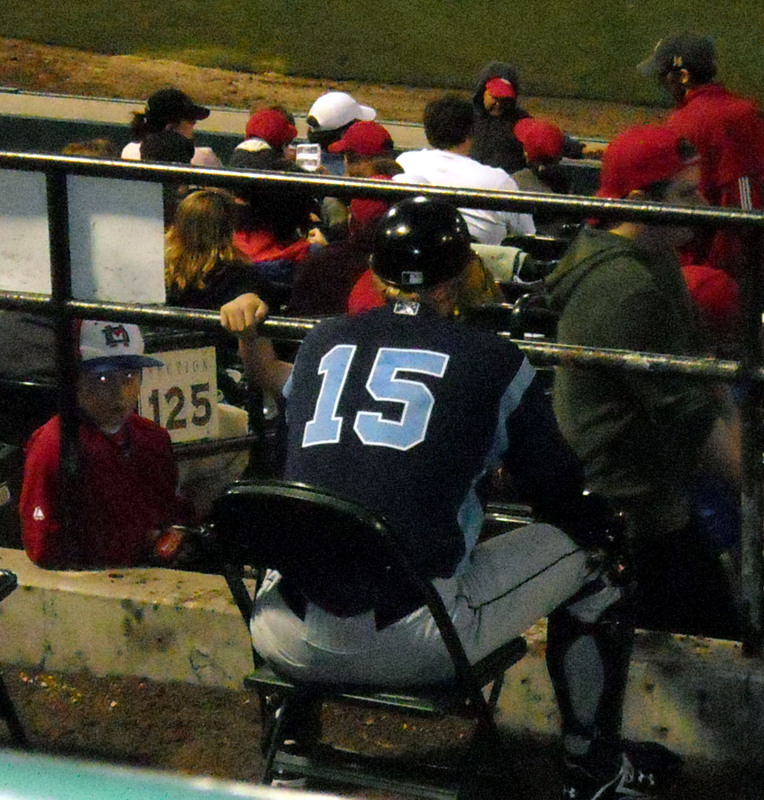 There are so many better traditions of baseball to pass along to one’s children than heckling. There is teaching them how to keep score or explaining the various rules of the game etc. While I hold little hope that ballparks will ever become heckle free zones I do hope that the amount of heckling will be minimized. Maybe baseball could set up sound proof heckle zones where people could heckle to their hearts content without the rest of the fans being exposed to it. Now if you’ll excuse me I am suddenly feeling the need to find a savings stampede. After all, like rodeo time they won’t be here for long. Paper or plastic? Coke or Pepsi? Boxers or briefs? The world is full of questions that equally divide people in terms of which answer that they feel is right. I was on the front lines of one of those debates years ago when I worked as a cashier at a grocery store in college. I was usually pretty good about guessing which bag type each person would prefer. You had your tell tale plastic fans, the old school paper fans and the hybrid double paper stuffed in plastic fans. Although reusable bags were not as popular then as they have become, there were a few reusable bag fans as well. When the store happened to be out of someone’s favorite type of bag it was clear to see that some handled it better than others. The world of baseball is no different than grocery shoppers when it comes to people having their personnel opinions on everything from whether the designated hitter is good or bad for the game or if it is ever good to intentionally walk in a runner. Another area of debate among baseball fans is bats. In particular, the two camps are divided over whether wood bats or metal bats are better. Wood bats are a staple of professional baseball. These fans also think lovingly of the Louisville Slugger plant that makes many of the wooden bats in the world and all the history associated with it. They would argue that the same love is not associated with the plants that make metal bats. So the wood bat fans are fairly entrenched in their belief that wood is good. While only wood bats are used in Major League Baseball teams from the college ranks down to the local Little League use metal bats. Metal bats also tend to be the preferred bat of choice for most recreational softball leagues. So who has the better bat? The metal bat fans will bombard the issue with science and statistics showing that a ball hit with a metal bat travels further than the same ball hit with a wooden bat. The wood bat fans will use the same statistics to say that balls hit with metal bats actually travel too fast and create a safety hazard for the infielders who have less time to react to a ball traveling in their direction. College players like the ones pictured for the University of Houston have used metal bats for years. So what makes the balls travel at different speeds depending on the bat type? Well class it is time to enter Ry the Science Guy’s Lab of Science for the answer. There have been studies done on bat types for years and each one includes many formulas and equations and other rationale for what makes each bat type tick. One could spend hours debating all of the data and trends associated with bat speed and ball velocity upon impact. We are not going to spend hours on that however. The simplest reason for the difference in ball speed after impact involves which element in the bat/ball equation is flexing. 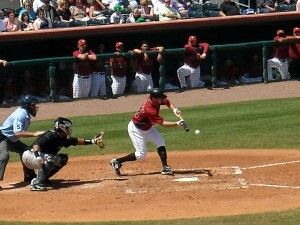 With a metal bat, the bat flexes at impact with the ball and then springs forward creating extra force behind the hit. The wood bat does not flex as much and the ball actually flexes and dissipates some of the energy leading to less energy being imparted onto the ball moving forward. Washington Nationals sensation Bryce Harper, shown during spring training in Florida, has been known to crash a few Washington area softball games to get in some metal bat work. So there you have it, metal bats make the ball go further due to a trampoline like effect on the ball and the wood bat absorbs more energy than it returns. Given that simplest of reasons one would think that everyone would want to use a metal bat to get the most out of their hits. But, then again there is the whole issue of how fast is too fast. In fact, a few years back New York City tried to ban metal bats at the high school level citing safety as a major reason. After threats of lawsuits and the usual political process the ban was lifted and each league was left to regulate the type of bats used. Which is not to say that wood bats are completely safe to use. Anyone watching enough games will no doubt have seen shattered bats flying towards pitchers and infielders. In some rare cases the parts of the broken bats have injured the players on the receiving end. While the risk to fans in the stands is mostly limited to getting hit with foul balls bats and bat pieces also find their way into the stands. Given the choice I think I would rather have a wooden bat flying towards me than a metal one but I would prefer to not have to dodge either one. Most ballparks have warnings such as this one to alert fans to the inherent dangers they face. 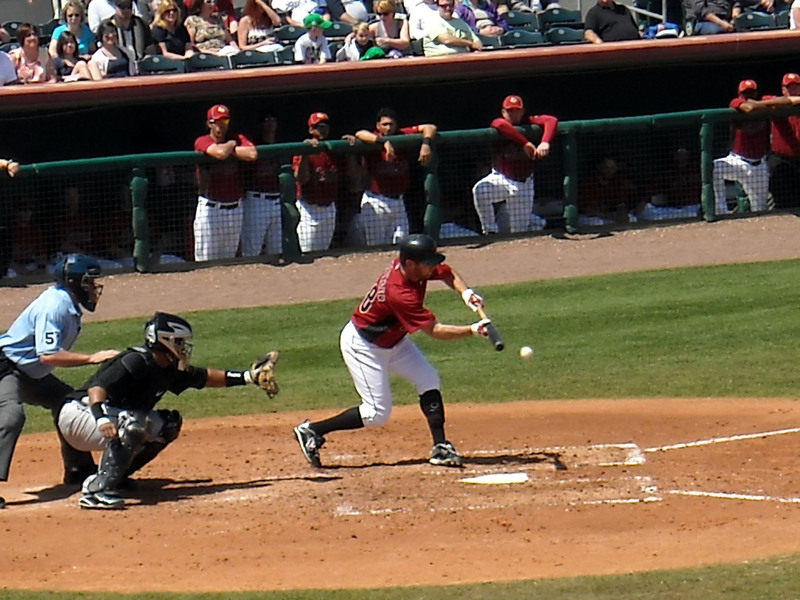 Aside from balls, bats and pieces of bats are also often hurled into the stands at high velocity. I have often had my own questions regarding the metal versus wood equation. Primarily, I have always wondered why players would not use the wooden bats as early as possible in order to be accustomed to them in the event that they were fortunate enough to be drafted by a Major League club. Instead, many players do not start using a wood bat until their first professional games and then there can be a learning curve as well as disappointment when the ball does not go as far as it did with the metal bat. During my brief baseball playing career, which consisted of a season of T-ball and a couple of Pony League seasons, I used both wood and metal bats. I tended to prefer the wood bat over the metal one. 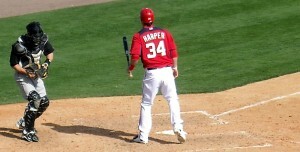 I liked the sound that the ball made on the rare occasions that my bat made contact with it. The ping of the metal bat just never sounded right to me. I also disliked the metal bat for its tendency to give me stingers when it was held incorrectly. Nothing like severe numbing pain shooting up the arms to make one not like a certain bat type. So the wood versus metal debate will continue to rage on and most likely will never truly be settled. I would be very surprised if a day ever came when metal bats would make their way to the Major League teams but one should never say never I suppose. Now if you’ll excuse me all of this talk of bats has made me nostalgic for my old whiffle ball bat. It is bound to be around here somewhere and it never splintered or gave me stingers. Today is President’s Day, or Washington’s birthday as it is also known. While originally the holiday was thought of as a way to recognize the two presidents with birthdays in February, Abraham Lincoln and George Washington, President’s Day has grown to include a time to honor all of the men, and most likely some day women, who have served in the nation’s highest office. Of course, if one has been watching television the past weekend, it appears that President’s Day has also become a time to buy furniture, appliances and cars at unheard of savings. While the founding fathers wanted us to enjoy various freedoms, I doubt they had no interest financing on washers and dryers in mind. Then again maybe they did. So for our purposes let us not focus on the retail aspects of the day but let us try to focus on the office of the President and what that entails. To date, 44 men have served as President of the United States from Washington to Obama. And while the nation still recovers from the latest multi-year campaign for the office it is important to remember that by and large the system of government that we enjoy is for the most part stable and allows each of us to enjoy freedoms that we would not otherwise have under certain other governmental systems. And of course there is still that whole area of no interest financing. I really need to stop watching television on holiday weekends. Campaign bumper sticker for the 1992 campaign of Bill Clinton. Clinton defeated George Bush to become the 42nd President of the United States. I was fortunate enough to come face to face with one of the men who would go on to become president. In 1992 I met Bill Clinton at a campaign event in Orlando, FL. While the election was still months away, and Governor Clinton had not yet become President Clinton, there was still something cool about meeting someone on the campaign trail. I am far from the most politically active of people and part of that was by choice. I felt a reporter should be impartial and not let their political leanings show so I always tried to use that mantra as my guide. Years later though, meeting candidate Clinton is still one of the more memorable moments of my journalistic career. I am sure that reporters that cover the Presidents on a daily basis lose some of the wow factor at some point but there always needs to be a respect for the office at some level. So on this presidential holiday let us not focus on the civics behind the position, or the red state versus blue state leanings. Let us not even focus on the plethora of sales that will end tonight at midnight. Instead, let us focus on one of the many perks of residing at 1600 Pennsylvania Ave. in Washington D.C.; the ceremonial first pitch. President William Howard Taft started a tradition in 1910 that has linked the Commander in Chief with the National Pastime ever since when he threw out the first pitch on Opening Day. The first presidential first pitch occurred on April 14, 1910, at National Park in Washington, DC. during a game between the Washington Senators and the Philadelphia Athletics with Taft connecting on the pitch to Walter Johnson. The Senators moved to Minnesota to become the Twins and the Athletics packed up and headed west to Oakland but the one constant for 103 years has been presidents and baseball. From 1910 to 1971 the President traveled to the home ballpark of the Washington Senators to throw out the first pitch on Opening Day. To put that streak into perspective it stretched from Taft to Richard Nixon. While Presidents had thrown out first pitches at the World Series as well President Nixon became the first president to throw out an Opening Day pitch outside of Washington D.C. in 1972 when he threw out the pitch in Anaheim, California since there was no longer a team in Washington. Various other ballparks were used for Opening Day after 1972 but Baltimore and Washington D.C. were the most widely used due to proximity to the White House. While the first pitch did not occur until 1910 the link between Presidents and baseball actually goes back to post Civil War America when Andrew Johnson invited the first team of professional ballplayers to the White House. Other teams were invited as well in the years to follow by other presidents. 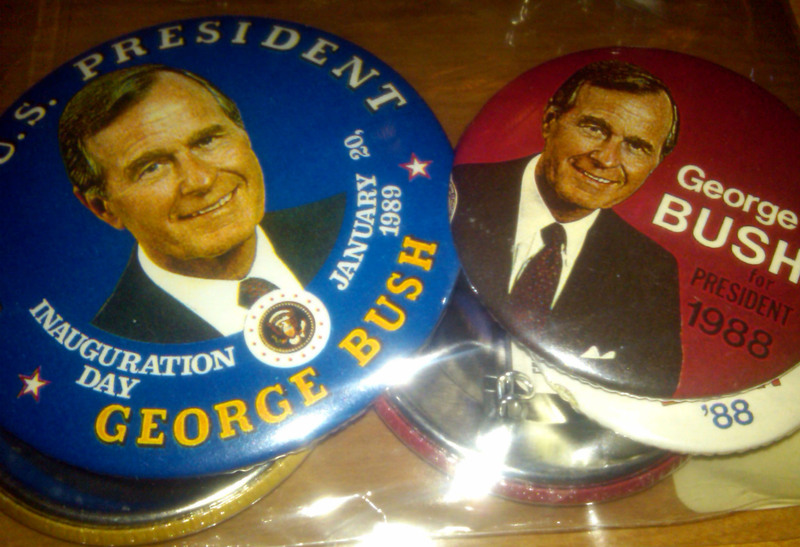 Campaign buttons From George H.W. Bush’s 1988 Presidential campaign. 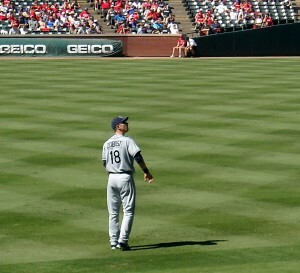 Bush, was a former college baseball player and can often be seen at Minute Maid park watching the Astros play. The Presidential links to baseball are not limited to first pitches alone however. Both President Bush 41 and President Bush 43 also have deep baseball roots. George H.W. 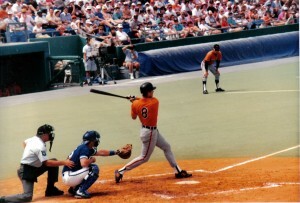 Bush was a baseball player in college and can often be seen behind home plate at Houston Astros games. It is also a given that if both President Bush and his wife, Barbara, are seated together they will end up on the stadium kiss cam. So on this day that we honor our Presidents let us not forget that soon it will once again be Opening Day and when the President steps onto the mound to throw that first pitch he will be continuing a long standing tradition that honors both the past, present and future of both the Oval Office and the game of baseball itself. Now if you’ll excuse me I think I need to practice my pitching just in case I am ever called on to throw out a first pitch. 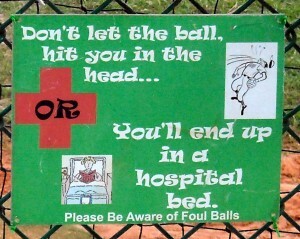 After all, no one wants to be the person that bounces it a few times on the way to the catcher. Once upon a time there was a cup. This cup allowed people to put their beverage of choice in it and travel from the beverage source to any other place that they wanted without fear of losing the contents within. Gone were the days of cupping one’s hands together to get a drink from the well or filling a gourd, cow stomach or other container with liquid. And while the cup was good, and practical, it was not living up to its full potential. That is until the cup became known as the souvenir cup. Travel to most any sporting event or other event of note and odds are one will be exposed to a souvenir cup of some sort. This cup is usually larger than its other cup brethren and includes features like reuseability and serves as a reminder to all who see it that the holder of said cup was at the sporting event it depicts. I am not sure when I first caught the souvenir cup bug but over the past few years I have accumulated quite the collection of plastic cups from various venues. There are three things I try to collect from every ballpark that I visit. The first is a ticket stub. The second is a game program. And the third is, you guessed it, a souvenir cup. 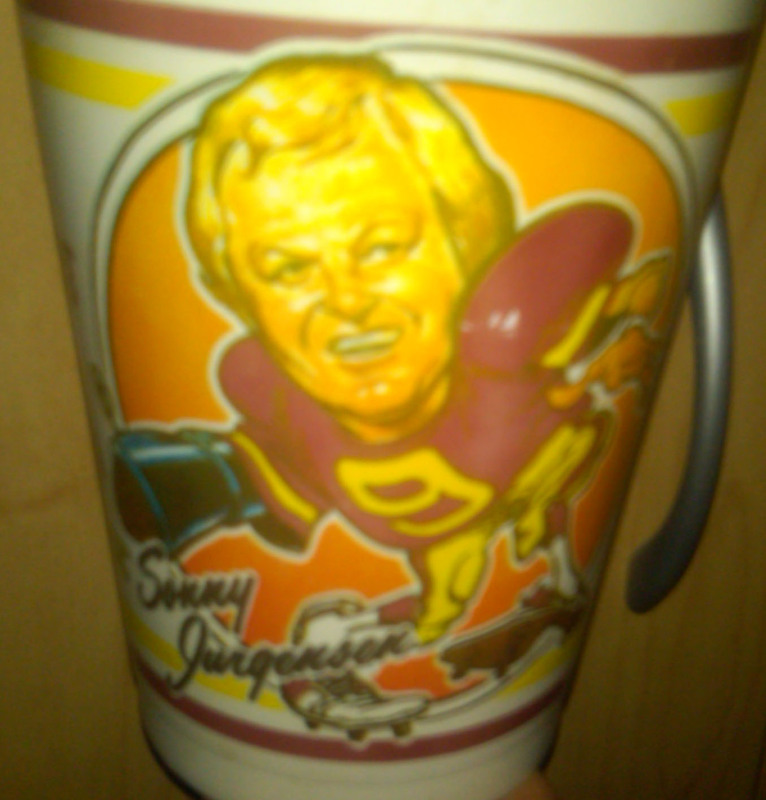 I was given several Souvenir cups from the Washington Redskins during the early 80’s and while I still have them, I do not really count them as part of my collecting history since they were not actually collected by me. As near as I can recall my first souvenir cups that were collected by me were ICEE cups from Tinker Field in Orlando, FL. 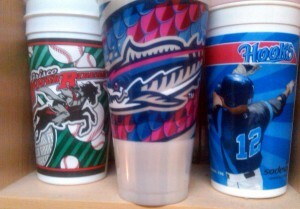 While not being specifically made for the team I was watching, these cups featured each of the Major League teams and also had the added bonus of containing ICEE inside. The cup that started it all. My cup collecting was not limited to ICEE cups however. Once I got to college I soon added many University of Central Florida cups to the collection. One could argue that plastic cups would serve the struggling college student well but I had plenty of actual glasses in my cabinets so the cups were manly turned into display pieces and were in no means used for the purpose they were intended. Fast forward past college, and the cup collecting was accelerated by trips to various minor and major league baseball parks. Every time I visited a new ballpark I made sure to get a souvenir cup. But I did not always stop at a single cup to stadium ratio. Often each time I visited the same stadium I would end up getting a cup until my pantry turned into a sea of plastic. In my defense some teams would put out several different versions of cups over the course of the season. Some of the more unique cups are on display in various areas of my office and home while the rest are in static display in the pantry. Now and again I will take the cups down and look at each of them as an archeologist would study some relic of a long lost society. The cups serve as a time capsule, both for the state of sports marketing and cup technology of the time, as well as showing glances at who was considered the star player at the time the cup was issued. 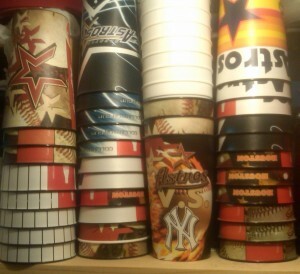 A selection of Houston Astros Souvenir cups accumulated over the past five seasons. The star player portion is more limited to the Major League cups as opposed to the Minor Leagues due to the frequency in which players move through the minor leagues. 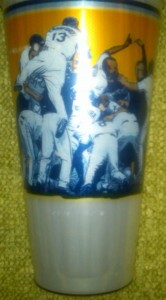 The past few seasons the Astros have also moved away from featuring players on their cups. One could argue that they are also avoiding highlighting players who will not be on the team long. One particular pet peeve of mine involves the Houston Astros and their lack of souvenir cups at their Spring Training facility. This will be the first year under new ownership and there is a new logo for the team so perhaps this will be the year that the souvenir cups appear but having gone to the ballpark for the past few years and not getting a cup I am not holding out much hope for a change this year. 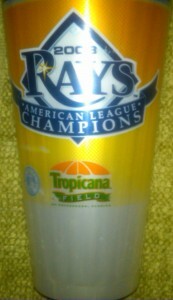 Every other Spring Training game I have attended, away from the Astros home field, has had a souvenir cup of some kind. So it is not like Spring Training cups are a foreign concept. A selection of Minor League Baseball souvenir cups. While most of my cups were purchased there is another approach that can be employed by the savvy cup collector. While I am in no way encouraging ballpark dumpster diving, often times people will leave their precious cups in the cup holder or other areas around their seats when they leave. So, if you don’t feel like buying one, and the idea of carrying out a cup with someone else’s back wash in it doesn’t creep you out, then by all means grab a few cups on the way out. You are helping ensure that the ballpark cleaning crew has fewer cups to clean up. You are also helping the environment as well by keeping the cups out of the landfill. I have only employed this technique once when I was at Tropicana Field in 2009. I knew that it would be a few years before I would make it back there and while I had already purchased one cup I happened to see a different cup on the way out and decided it was worth adding to the collection. The cup commemorating the Tampa Bay Rays first World Series appearance. 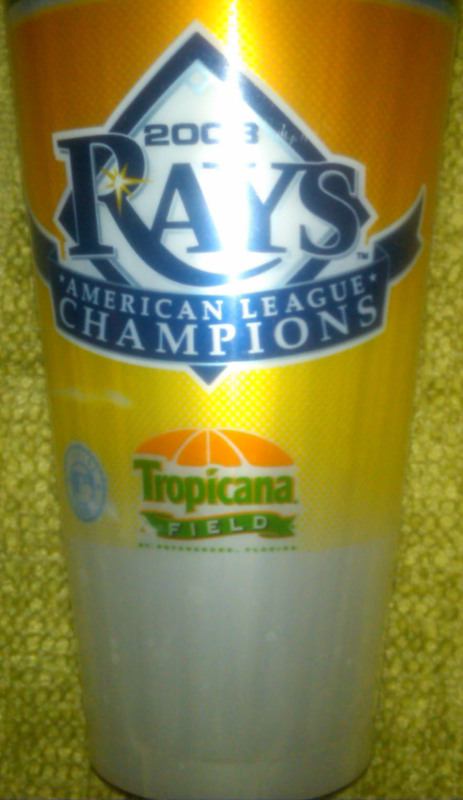 The front of the cup commemorating the Tampa Bay Rays first World Series appearance. This brings up another aspect of the souvenir cup hierarchy, different cups for different types of drinks. Many ballparks will have a different cup for the alcoholic and non alcoholic beverages to help ensure that underage patrons are not walking around drinking things that they shouldn’t be. So in the event that there are multiple cup types I suppose a cup scavenging approach could be warranted to ensure that you left with a full set. I actually tried to discover when souvenir cups first appeared on the scene but sadly I was unable to locate a source that said, “behold the birth of the souvenir cup.” Short of that I guess one can assume that as long as there have been cups there have been souvenir versions of them. Perhaps archeologists can discover the Rosetta Cup deep in some pyramid or other area to shed further light on the subject. So there you have it, the pros and cons of souvenir cup collecting. It can be a relatively inexpensive way to bring home a little bit of that ballpark experience while providing much needed hydration during the game. Plus, the cups are stackable which certainly helps when it comes time to store them. Now if you will excuse me, all of this talk about cups as made me thirsty and in need of some water. With Great Fame Comes Great Responsibility; or Does It? We are a society that enjoys placing people on pedestals. Whether it is actors, athletes, or any number of other categories, people who possess certain skills are often elevated above the rest. As long as the elevated people behave in the manner that the masses below expect there are no issues. But, once they start to slip, the lofty spot gets a little wobbly ahead of the inevitable crash back down to earth. As a youngster I had a few role models/heroes from the Baltimore Orioles. I would watch these players and coaches on the television each night and all I knew of them was the persona that was projected through the broadcast. These were the pre internet years and still part of the time when the media didn’t feel the need to report every aspect of a person’s private life. So the elements that were broadcast were largely related to actual performance on the field. If a player happened to go home with someone other than his wife after a game, or went to a bar until it closed, it was not blasted across the sports section the next day. The media considered it their job to cover the game between the lines and anything else was considered a personal matter between the player and his family and not something to be broadcast across the wire for the world to see. This relationship tended to bond the players and the media together as did the countless hours that the media spent traveling with the players. It was not that the reporters were withholding information from the public, it was that they respected that the athletes were flawed people like the rest of us and there was no need to air dirty laundry that was not related to their jobs. Sadly by the time I entered the profession the 24-hour news cycle was already in place and the players lost some of their privacy forcing reporters to dig deeper into stories that were not really stories leading to a tabloidization of the sports section. I would love to think that we would grow tired of trash journalism and return to a more noble way to handle things. Sadly, that genie has been out of the bottle for far too long to go back now. Adding to the difficulty of returning to simpler times is the fact that we have generations of people who don’t know any other way to do things. A few years back, okay a decade or two back, my mother picked me up from school to go see a Spring Training game for my birthday. This particular game featured the Baltimore Orioles and the Minnesota Twins. We arrived early at the ballpark and as we were reaching our seats Hall of Famer Frank Robinson came out to the wall where people were signing autographs. I took my game program over and waited to get his signature. Instead of moving through the line of children that were waiting Mr. Robinson proceeded to flirt with a pair of women and totally ignored the waiting children. And while this event happened over 25 years ago the memory is still as fresh today as it was then. While Frank Robinson had every right to not sign the autographs, the manner in which he left me and the other kids waiting left a lot to be desired. He could have just said, “sorry kids, I don’t sign autographs” and we would have gone back to our seats but for this “role model” to totally ignore his fans was not the best way to handle things. Actress Natalie Portman has famously said on numerous occasions that she is not a role model and that her celebrity alone for doing her job does not make her feel any additional pressure or responsibility to all of the people who look up to her. While Natalie is right, what is it that makes people look up to celebrities and athletes and consider them role models? For me, I consider a ball player who plays the game the right way and doesn’t get caught up in scandal a person I can respect. Of course it is getting harder and harder to know who to respect as there are almost daily reports of players who were caught or suspected of using steroids and other banned substances to get an advantage over the competition. Often times it is a no brainer to catch the cheaters. There was never any doubt in my mind that Barry Bonds, Mark McGuire, Sammy Sosa, and Alex Rodriguez had a slight advantage that perhaps was pharmaceutical based when they were posting their monster numbers and crashing through the record books like a runaway train. While certain players make it easy to determine guilt or innocence through failed drug tests and other means the line between guilty or not guilty of Performance Enhancing Drugs, or PED use is a little murkier for some. Another player caught up in the web of suspicion of using PED’s was Roger Clemens. While only “The Rocket” knows for sure what he did and didn’t take, I, and a federal jury, do not believe that he took anything that was illegal to gain an advantage. Do I think that he is a good role model? Not really based on some of his off field activities. Despite not considering Roger Clemens a role model, I do respect the way he played the game and the dominance that he showed for decades. Despite being cleared by a jury in a perjury trial Roger Clemens will face an uphill climb in his bid to gain entrance into the Baseball Hall of Fame. Logic says that based on his career numbers and the legal victory he should be a lock for Cooperstown. But after failing to gain entry on the first ballot it appears the voters have a different take on the matter and the guilty by association tag will follow him for years to come. One player that I followed that always seemed to play the game the right way, and never got into any controversy was Cal Ripken, Jr. Cal was the longtime shortstop and third baseman for the Orioles. 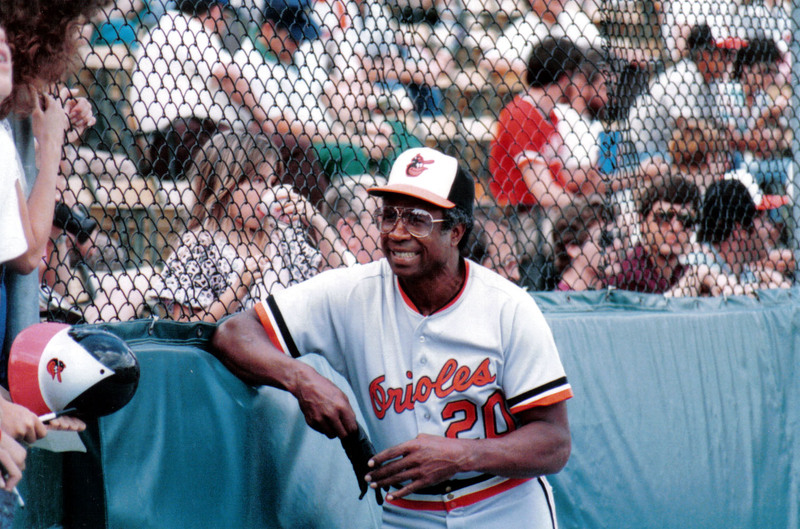 Cal played all of his 21 seasons with the Orioles and became known as “The Iron Man” for breaking Lou Gehrig’s 56-year-old record of 2,130 consecutive games in 1995 and playing in 2,632 consecutive games overall before missing a game for the first time in 1998. To put things in proper perspective from 1981 to 1998 Cal Ripken, Jr. did not miss a single day of work. Granted, work consisted of playing baseball from April to September so one could argue he had around half of the year off. Still, I am not sure there are many people in any profession that can say that they have gone that long without missing work for vacation or sick days, etc. So I looked up to him for the way he played the game and the quiet manner in which he approached things while amassing some huge numbers for his position. Cal Ripken, Jr. has also written several books on how to play the game and in his retirement is active in placing ballparks in underprivileged areas to ensure that everyone has access to quality baseball fields. So do players and other celebrities bare a responsibility to be role models? It is hard to say. Is Natalie Portman correct in her assessment that she just does a job and people need to leave her alone or should ballplayers and other celebrities be expected to be more like Cal Ripken, Jr. and continue to give back after their playing days are done? I like to think that players would want to be someone that is worth looking up to but I also know it is the media and the public’s responsibility to identify people who are worth emulating, and those who have behavior traits that should be ignored. Do I realistically think that this approach will ever come to pass? I like to think that I am optimistic about most things but must admit a large dose of pessimism on that regard. It seems we have now entered a phase where pedestals are built to be broken and while we tend to honor people who build themselves back up after the fall it also seems like many people are knocked down just for sport and the people who just go about their business without drawing excessive attention to themselves are ignored. Now if you’ll excuse me I think younger me needs to come to terms with Frank Robinson giving him the brush off.